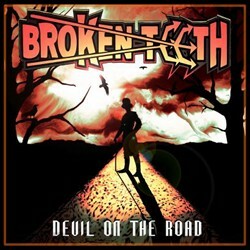 Singer Jason McMaster, best known for his work with Dangerous Toys, has released a new single with his band Broken Teeth. The song, entitled “Devil On The Road”, is now available for purchase as a digital download at CDBaby.com and Amazon.com with a portion of the proceeds going to deceased bassist Travis Weiss’ family. Hailing from Austin, Texas, Broken Teeth are all about keeping real rock ‘n’ roll alive. The band, which is influenced by classic hard rock acts like AC/DC, Rose Tattoo and Thin Lizzy, is comprised of vocalist Jason McMaster, drummer Bruce Rivers, guitarists Jared Tuten and David Beeson, and, presently, bassist Robb Lampman (Skrew). Travis Weiss, founding member of Austin band Duke UKE — who recorded a new album last year with producer Paul Soroski (Podunk) that is expected to be released on RockArmy Records sometime in 2013 — served as touring bassist for Broken Teeth over the past couple of years, and performed on the new single. Tragically, Weiss unexpectedly passed away in September 2012, forcing both bands into temporary hiatus. The release of “Devil On The Road” is both a tribute to Weiss, since it represents the final recording he made before his death, and a call to arms for Broken Teeth to continue carrying the flag for classic rock ‘n’ roll in Austin.